The actual canvas is exactly as pictured. It is for my bedroom and the many shades of blue & grey in the tranquil coastline scene will coordinate with so many sheet set options! Love it! Dimensions 1.5 In. X 46.0 In. X 36.0 In. It looks so nice on the walls and it’s maching my furniture and with four panels it’s so beautiful. I recommend this wall art because it gives your living room a great decoration. 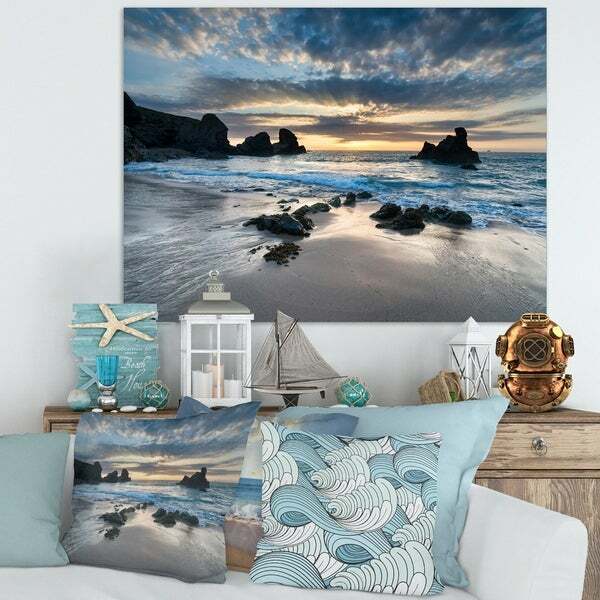 I love the Seashore Canvas, I only wish it was framed. It is very relaxing and is a great reminder of our trips to the ocean. The colors are soft & lovely. The canvas was packed well & it arrived very quickly. This is the only item I have received from this order 220572653. Please check your records and see if they Match with mine bc I received a notice saying I received on June 2 that I received the calla Lillie’s and pink flowers in a vase. This is not true. As for this painting I’m doing a collection on my wall and This is just beautiful. The coloring is perfect. I love how the water rushes against the rocks so natural looking. Love this! I like the picture but the blues and grays create a dusky overall look . When I look at it on the wall, it looks like a storm about to erupt. I want a more upbeat impressionso will return it. The quality is good and arrived quickly. The canvas wall art print is beautifully done & printed. It reminds me of a memory my husband and I shared in Pacific Grove, CA with the rocks and the waves washing over the black rocks. I ordered another canvas wall print to go over my sofa with a tree and flowers - another one of my memories and current love of flowers! This canvas print was simply beautiful! I purchased it as a gift for my sister's birthday. Unfortunately, the shipping company did not handle it carefully and it arrived damaged. The print was high quality and I was so disappointed that I would not be able to give it to my sister. I plan to reorder it later perhaps as a Valentines Day gift. I am giving 4 start only because of the damage. This is a beautiful print, looks exactly like the photo. Some reviews said it wasn't packaged well and theirs had damage, however mine was delivered on time and in good condition. The only problem is I should have ordered a larger size so I will try to exchange for a bigger one to fill the space. I highly recommend this print. It's has an amazing beautiful quality to it. Beautiful frame adds a soothing touch to any room. Love it! Very clear picture but seems like the frame was a little bent/twisted in shipping. I Should be able to get it flat and hang on the wall. Overall a nice picture. I bought this for my office and I think it looks great! I bought the multi panels because I thought it was more interesting. Sturdy construction. Nice conversation piece. Love this pic. Looks exactly like the picture and is so beautiful. This is a gorgeous scenic view and I love how I feel every time I look at it. Standing beside the seashore brings many cherished memories to mind. This picture was picked out not only because it is so pretty, but the size is perfect to display over my fireplace mantel. I would absolutely recommend this anyone who enjoys scenic views of a seashore. I will treasure this for the rest of my life. it's going to look beautiful where it's going. colors are perfect.